I can’t help but occasionally search for other Amazon affiliate websites to help me formulate strategies for my own website. Recently, I found one whose domain is supposedly registered by a famous TV icon of years past. It’s possible that the name might be coincidental, but I really don’t think so. Before I dive into that, I’ll go over this month’s statistics, per usual. First, for the readers of Niche Pursuits, I just want to say, you guys are awesome! It’s been several months now since the first report of Niche Site Project 4 and the remaining participants should feel proud of their accomplishments. I’ve watched the number of participants dwindle from 120+ to just over 30. If you’ve made it this far, please give it at least a year! I’m not making as much as I expected at this point but I do think a large jump will eventually occur. It’s really encouraging to read that several people are making a decent amount of earnings, so keep it up! No change from last month. That’s not surprising since no link building has been done, yet again. I’m finding it extremely difficult to juggle everything I want to accomplish with ranking Kettlebell Krusher. Of course, I have my bread and butter job of building websites for clients. However, there is also creating content and blogging for the niche site as well as this one. Having new and fresh content takes priority over link building, but it’s hard not to feel like I’m neglecting this task. Fortunately, my workload for Precise Online Management is starting to pick up. This will give me some extra cash to invest into Kettlebell Krusher for content writing. Specifically, guest posts. While I prefer to write all the content on the niche site myself (at least for now), I’m less apprehensive about outsourcing content to be posted on other websites. Depending on how much money is at my disposal, I may or may not do my own outreach for these guest posts. A new metric, traffic forecast, helps to set expectations for monthly traffic. Very little movement occurred in keyword rankings when compared to last month. The better performing 4,400 keyword did inch closer a couple spots to the top 10. Some of the smaller volume keywords also moved up a spot here and there. A new 70 volume keyword was added to this list debuting at position #16. This is to track another product comparison page that I’ve created after not having done so for months. 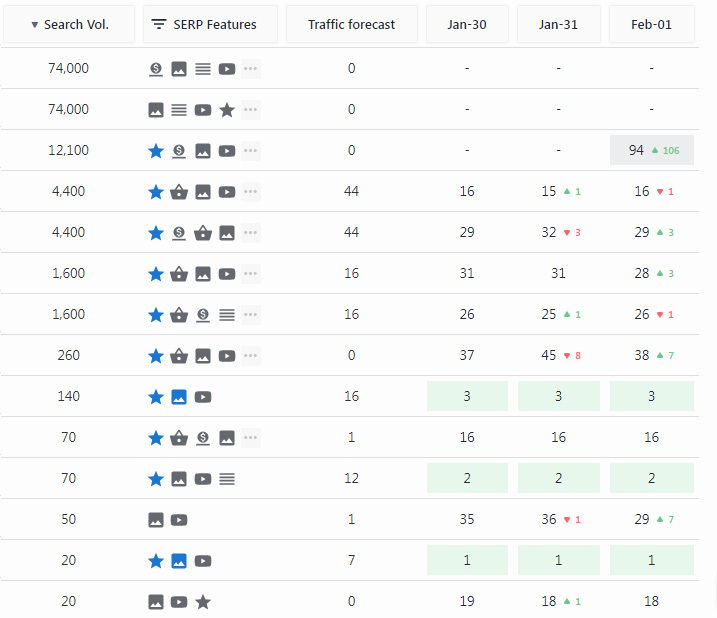 The team at SE Ranking continue to improve upon their keyword tracker. A new feature, traffic forecast, was made available as an optional data column. As you might’ve guessed, this feature estimates how much traffic might be gained for a particular keyword at its current rank. I opted to include this over the SERP Results metric column for the time being. Despite the lack of any major movement among these keywords, organic traffic continues to be the #1 source for bringing visitors to my website. Nearly 60% to be exact. I did think that an increase in direct/referral traffic from this blog (from you guys!) would give a decent boost to overall rankings. At least for now, that hasn’t been the case. A few returns and lower conversion % resulted in less earnings this month. So there are two ways at looking at the drop in commissions as compared to last month. The first is frustration and disappointment. 3 Returns (and I know 1 was on the larger side) really took a decent chunk out of the total earnings. Nothing I can do about that. Then the conversion % came crashing back down to earth. That was expected. The other perspective, a more optimistic outlook, concerns click count and stability. 247 clicks vs. 137 clicks from December! That’s over 100 more this month! If you compare the two graphics, you’ll see that the clicks have leveled off on a day-to-day basis. More so than the previous month. So in a sense, the fish are biting and I just need to reel them in. On another positive note, the final day of the month ended with 5 orders with over $150 in total revenue. Of course, I won’t see those earnings listed until the next month. Still, it’s a good feeling to go out on top after seeing the decline in earnings. Finally, we have water above land again! Huge month for traffic gains! 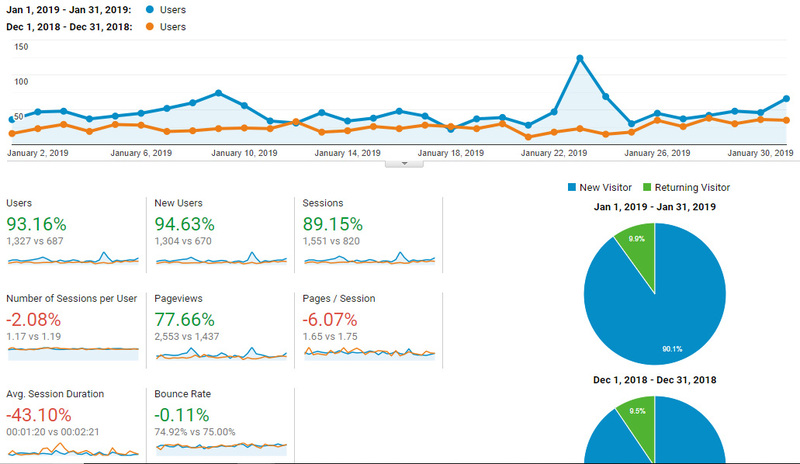 Traffic for this month nearly DOUBLED that of last month’s. Now, some of you are thinking, how much does that have to do with referral traffic on this blog from the reveal? It’s a valid question. The answer is 88 visitors. That’s a drop in the bucket of 1300+ visitors. So where is it all coming from? As I mentioned before, the organic traffic accounted for over 50% of overall traffic for the month. Almost 300 more organic visitors than before. And yes, referral traffic did go up by 150 visitors, half of which was from the reveal. However, the biggest impact percentage-wise was social traffic. A couple of my Pinterest pins I posted in January really took off. That resulted in over a 1000% increase in visitors (159 to 13) from December. I wish I could say that I’ve found some magic formula. I’ve tried to replicate the popular pins success by using similar templates, descriptions, and hashtags. I have a general idea of popular categories but that’s about it. It’s not like I’m frequently pinning each month either. Definitely less than 10 pins a month, including saving other’s pins (I need to be better about that). Which Celebrity Joined the Amazon Affiliate Program? Doing research from time to time on Amazon affiliate websites, I sometimes stumble on an impressive site or two. Never did I expect to come across a celebrity’s name when finding one of these gems. I’ll let the whois snapshot below answer the question. Scott Baio really wants to help you sleep better! 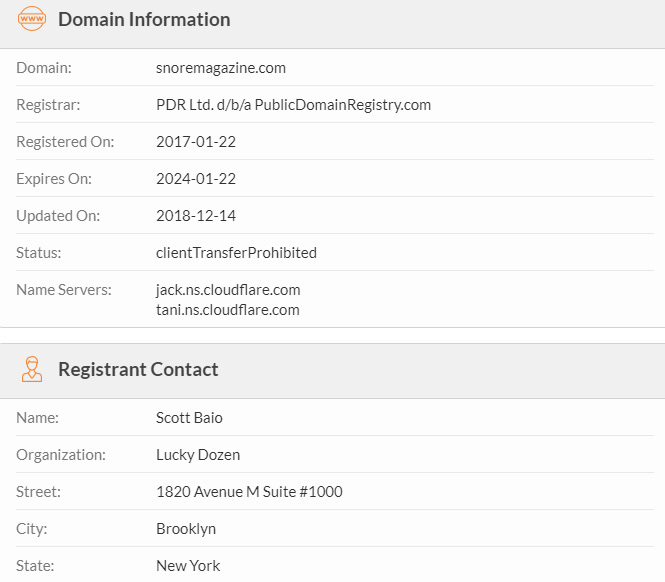 As you can see, the domain snoremagazine.com was registered just a short couple of years ago. What surprised me, even more, is the fact that it wasn’t registered privately. It has the address, organization, and the name in plain view. Do you recognize the name? If not, that’s okay. Scott Baio’s heyday was back in the 80’s as a lead actor on the popular sitcoms Happy Days and Charles in Charge. His place of birth? Brooklyn, NY. That just happens to be the same area the domain address is tied to. Hence my belief that it really is the actor, Scott Baio, and not some coincidence. Scott’s still looking great after all these years! My first impression when viewing Snore Magazine is that it is a decent but basic template. The primary menu items serve as the hub for the many sub-categories underneath each main category. Looking at the articles, they all seem to be within the 2000-3000 word range. Although I think that by not using the API, the conversion ratio isn’t as good as it could be. Let’s see what my favorite SEO tool says about the growth of the website over the last two years. In two years the site has built nearly 7,500 discoverable keywords. As many of you have probably experienced, the initial months of maintaining and building an affiliate website can be grueling. While there is some steady growth in the beginning, it’s not until year 2 when that trust and authority from Google starts to take effect causing a keyword explosion. I can only speculate, but I do believe in the Google sandbox which limits how much exposure a website can get in the first year. It’s possible that, in this case, the content produced was ramped up in year two. However, mass producing content alone isn’t enough to get in the good graces of Google. If that were the case, it would be spam city with affiliates loading dozens upon dozens of articles to achieve quick rankings. For Snore Magazine, the more than 7,000 keywords listed is a great accomplishment. The nearly 100k clicks per month that SE Ranking reports is close to the number that SimilarWeb shows. One thing to note is that the traffic cost ($126,673) isn’t an estimate of how much per month the website makes. Rather, it is an estimate of total cost if those organic keywords were paid keywords. The overall earnings are probably much lower. Although, I’d guess that those earnings would be anywhere from 10k-20k a month, which would be just fine with me! The most popular keywords listed below represent more than a 3rd of the organic traffic for Snore Magazine. What’s truly amazing is that the #1 keyword, Zyypah, ranks extremely well. This is a branded keyword and doing a check shows that only the company and amazon page outrank snoremagazine.com. Think about that, a 74,000 volume keyword and Scott’s site is sitting at ~#3. Not too shabby! For the most part these are all #1 ranked keywords! There’s one keyword in this list that is a bit of a surprise, chin strap for snoring. At a volume of 10k, I suppose it boils down to my ignorance of the snoring niche. The other keywords including pillows and ear plugs make sense, but a high volume for chin strap is perplexing. That’s what makes keyword research so important! How Did It Rank So Quickly? You can check off content as a requirement for this website ranking. Currently, 170 results are returned in google for snoremagazine.com That seems to be in line with other affiliate powerhouse websites. As I mentioned before, the word count for each page is substantial. This is something that you or I can easily replicate by outsourcing or doing some hard work. So there has to be more to it. Notice anything strange with these terms? Take a look at some of the anchor text in this backlink report. Most of them seem like they would fit the snoring niche. However, there are some that are odd. For instance, darwin 200 and art house. Those certainly don’t fit the terms for this niche. However, they are on the first page of the report when sorting by domain trust. If you visit the page with the darwin 200 anchor text, you’ll see that it is located at the top right of that site. Hovering over the link reveals the URL to be http://www.darwin200.org/index.html. Clicking on it redirects the visitor to snoremagazine.com. My first thought is that these two domains have nothing to do with one another. My gut tells me that you should avoid redirecting a domain that is completely unrelated to your niche. This discovery on the other hand, says the hell with that, DO IT! The referring page for darwin200.org is very old. According to the blog roll, the last update was 10 years ago. That’s one measurement of trust in the eyes of Google. It’s a .org domain which some SEO experts argue also gives an advantage over other domain extensions. Then there’s the traffic, TF/CF, and DA/PA. Respectively, 200k+ visitors a month, 64/56 (root domain), and 68/39. That’s one hell of a powerful backlink, but not the best! Another domain caught my eye in the backlink report. Although the domain trust level isn’t that high, the true and tried metrics of DA/PA and TF/CF are off the charts. Like, a step away from Google and Amazon! Plugging in this URL, http://www.bbc.co.uk/darwin/, shows that the anchor text of Natural History Museum – Darwin 200 on the bottom right of the page goes to the darwin200.org domain. Imagine that, an incredibly powerful backlink from the BBC of all places! Traffic: 605.7 Million monthly visitors! Now that is authority! Who knows how many other websites are linking to that darwin domain. I stopped digging into the backlinks report after that find. As if that wasn’t enough, the art house anchor text, which redirects arthousecoop.com to snoremagazine.com, is listed on several aged domains and pages too. That breaks another rule I thought was important which is never have more than one redirecting domain. Clearly, the risk is well worth the reward. I was curious to see where snoremagazine.com fell within some of the other great affiliate websites I’ve mentioned in previous Niche Dreams posts. I’ve taken fresh snapshots of the latest data reported for these sites listed in Part 1 and Climbing the Organic Keyword Mountain. So here they are ranked from worst to best! Bestazy has taken quite a tumble since first reported in August. The organic presence of KSR has been somewhat stable over the last year. It seems like Pick a Toilet is content staying just where they are. Globo Surfer continues to shine with a nice month-to-month steady increase. No losing sleep over these gains. Look at that steep increase over the last few months! Wow! This juggernaut is a content machine. Almost 60k keywords! Now if you’re wondering why there is a discrepancy with Snore Magazine’s screenshot from earlier in the post, it’s because more data has been added. I actually snapped the first screenshot yesterday. Looks like it just got updated today and those gains are huge! #2 is not a bad spot to be on in this list. Considering that My Pet Needs That is in a league of their own, I’d say Scott’s site is doing pretty damn well! Do I think Scott Baio is an Amazon affiliate genius? That depends. I don’t necessarily see him as someone doing this all by himself. I can see him bankrolling the entire thing and having a partner or two creating a profitable site. Whatever the case, I’d like to have Charles in charge of my affiliate website! I must say, he’s done an incredible job in a short amount of time of dominating the snoring niche. I still think he’s leaving money on the table by not making full use of Amazon’s API. On closer inspection, I do see some pages with tables that have prices. I’m not sure if those are manually entered (let’s hope not!) or using a plugin I’m unfamiliar with. Going back to my niche site, I really need to step up my game. My goal for the month of February is to post a video review of one of the products I use. I also want to work on getting some more scholarship backlinks, and hopefully another guest post or two. Currently, I’m in a tough spot, as business for Precise Online Management is picking up fast (thanks to my partner!) and I’ll be swamped with work for building websites. This isn’t a bad thing as I could certainly use the money. However, the less down time means the more difficult it will become to focus on Kettlebell Krusher. It’s kinda like my baby at this point. I don’t want to have a sitter of sorts, but I can’t get burned out doing too much at once. If I can outsource some work, that will help ease that burden.